“Tateyama Kurobe Alpine Route” that connects Toyama Prefecture and Nagano Prefecture through the 3,000-meter North Japanese Alps including Mt. Tateyama and Mt. Tsurugidake. In the middle of the winter, the route is closed because the snow is deep, but the snow event “Yuki no Otani Walk” (Walking through the Giant Snow Walls) will be held in part of the route from spring to early summer. It is an event that you can experience by walking “the Giant Snow Walls” which is a section of 500 meters where snow wall rises on both sides of the road. It is an event of spring to early summer only, which can be touched closely looking at the snow wall approaching 20 meters in high place. 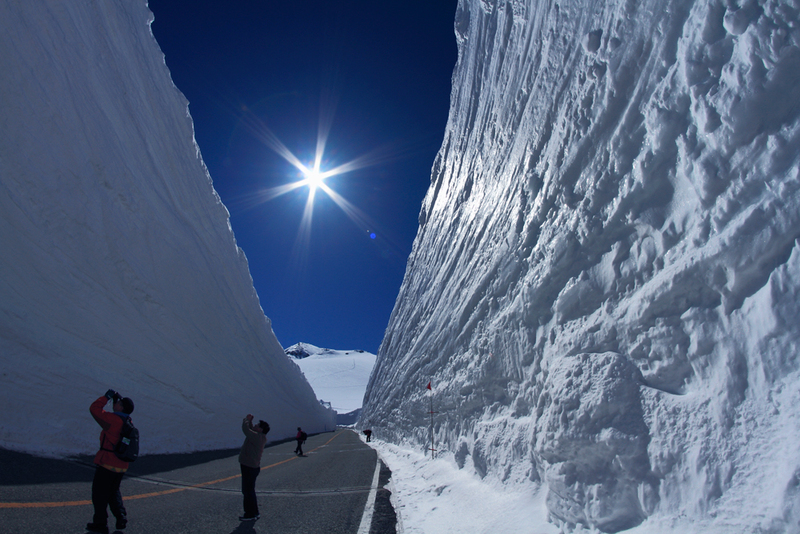 Tateyama-Murododaira with the “Giant Snow Walls” is located at an altitude of 2,450 meters and is one of the world’s heaviest snowfall areas. The walls of the snow rising on both sides remaining after clearing the snow that continues to that Murododaira is called “Giant Snow Walls”. “Yuki no Otani Walk” walking between the walls of the snow rising on both sides is the most important sightseeing tour of Tateyama this time. To Murodo which is the venue of “Yuki no Otani Walk”, you can go from the Toyama side (Tateyama) and Nagano side (Fanzawa), but the route from Toyama side where you can go at the shortest is recommended. 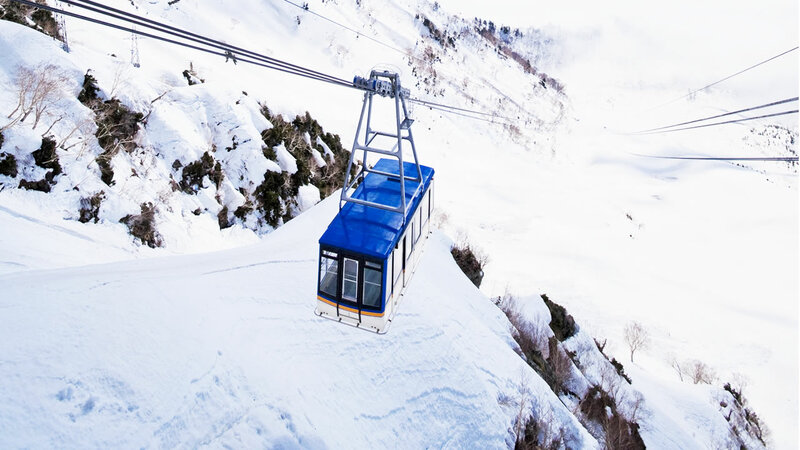 From Toyama side, take the Tateyama cable car from Tateyama station, take the Tateyama-Kogen bus from there, and then arrive at the Murodo Terminal, the nearest station “Yuki no Otani Walk” (Walking through the Giant Snow Walls) venue. The Tateyama Toll Road including “Giant Snow Walls” of this event is forbidden to pass cars throughout the event period, so you can only go to Murodo by fixed-route bus or sightseeing bus, or with permission. When you get off the bus at Murodo through the road with “Giant Snow Walls”, the venue of “Yuki no Otani Walk” is already in front of you. In addition to “Otani Rd”, there are “Snow Corridor”, “Panorama Road” and “Alps Square” at the venue. Because the area around this area is 2,450 meters above sea level, the temperature is only about 1 degree in spring. In addition, there is glistening of the sunshine in the pure white field of view, it is very dazzling, so take a pair of sunglasses. “Snow corridor” connecting Murodo Terminal and Tateyama Nature Conservation Center is also a road walking between snow walls, but unlike “Otani Rd”, pedestrian-only passageway where no traffic is allowed at all. The road width is narrow, and it is a place where you can feel the force of the snow wall more closely. The sky looking up from between the snow walls will surely remain in memory. Along the Tateyama Kurobe Alpine route, the height of the snowy wall of “Yuki no Otani” will be not less than 10 meters in the place with most snow coverage in the middle of May. In the car which passes through that place is full of surprise and a cheer. If you arrived at Murodo, a field of view will open at a stretch, and the wall of the snow which passed will teach a natural size. From the middle of April to the end of June, I can walk the dynamic snowy corridor as “Yuki no Otani Walk”. “Tateyama Ropeway” is 1,710 meters in total length and 500 meters of the depth, and it is linking Mt. Daikanbo to Kurobe flat in seven minutes. You can look at the Kurobe lake or the Tateyama mountain range dynamically, and is right “a moving observatory.” This ropeway is famous also as the longest “One Span Ropeway” in Japan. Murododaira is the center of the Alpine route located in the altitude of 2,450 meters, and is a base of sightseeing. The grand mountains of the altitudes of over 3,000 meters including famous Mt. Tsurugi and Tateyama three mountains are before your eyes. 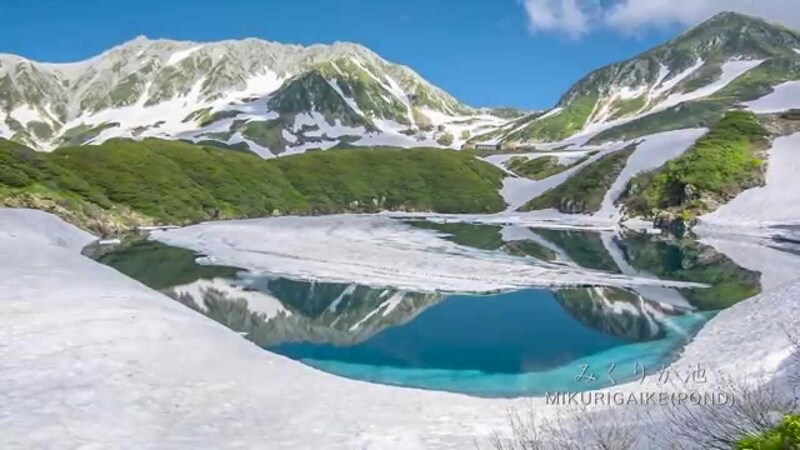 You can see “the lake Mikuriga-ike” which is the deepest lake in high mountain and volcanic activity of “Jigokudani” (Hell Valley) in the Nihon Alps. You can feel spectacular of the great nature. The “Kurobe Dam” completed through much difficulty in 1963 is 186 meters in height, 492 meters in length, the Japan’s biggest arch-type dam. 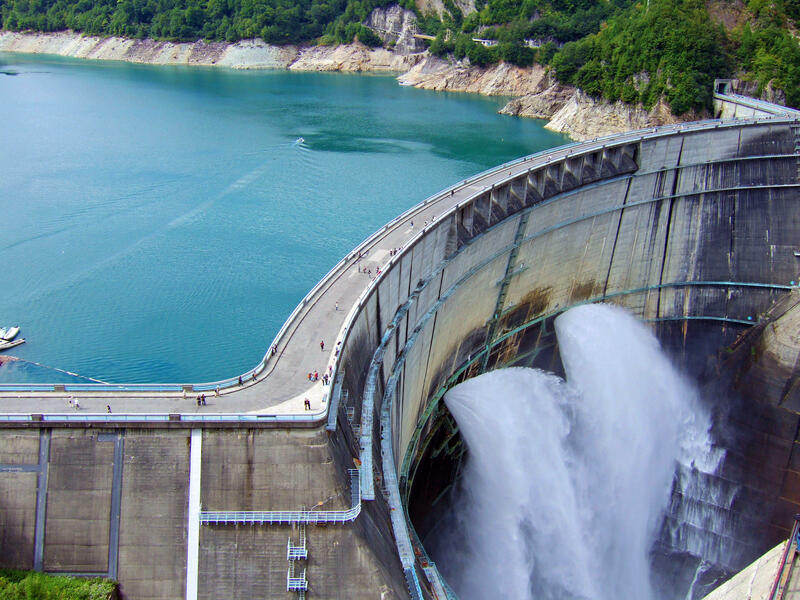 Sightseeing water-drainage of Kurobe Dam which blows off more than 10 tons/s of water is dynamic. The view from the new prospects open space completed in 2003 is recommended. The area around here is the world’s leading heavy snowfall area, and the height of the snowy wall can also be 20 meters for a year with much snowfall. It is the overwhelming spectacular equivalent to a 10-story building. You can walk there during 10:00 to 15:00 at the middle of April to the late in June.